Embodiment in Qualitative Research connects critical, interdisciplinary theorizing of embodiment with creative, practical strategies for engaging in embodied qualitative research. Ellingson equips qualitative researchers not only to resist the mind–body split in principle but to infuse their research with the vitality that comes from embracing knowledge production as deeply embedded in sensory experience. Grounded in poststructuralist, posthumanist, and feminist perspectives, this innovative book synthesizes current interdisciplinary theories and research on embodiment; explores research examples from across the social sciences, education, and allied health; and features embodied ethnographic tales and evocative moments from everyday life for reflexive consideration. Each chapter offers flexible starting points for doing embodiment actively throughout every stage of qualitative research. An awareness of, and an active engagement with, issues of embodiment enhances scholars’ ability to produce high quality research and enlarges their capacity as public intellectuals to spark positive social change, particularly within marginalized communities. The strategies offered relate to methodologies from across the entire spectrum: from traditional qualitative methods such as grounded theory, critical/theoretical analysis, and discourse analysis, to arts-based research — including performance, autoethnographic narrative, poetry, and documentary film making. 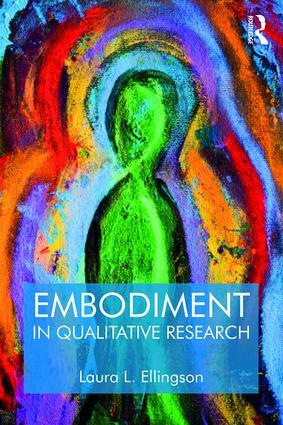 Embodiment in Qualitative Research is designed as a resource book for qualitative researchers who want to explore the latest trends in critical theorizing. The writing style will appeal to researchers who seek a bridge between abstract theorizing and pragmatic strategies for producing outstanding qualitative research, as well as to critical scholars who want to integrate embodied ways of knowing with their theorizing. Graduate (and advanced undergraduate) qualitative methods students and early career researchers, as well as advanced scholars seeking to enrich the scope and texture of their work, will find the text inspiring and engaging.